Subway sponsors our Friday Fresh Take where we provide a recap of some of the state's most notable games and performances from Friday night's action. 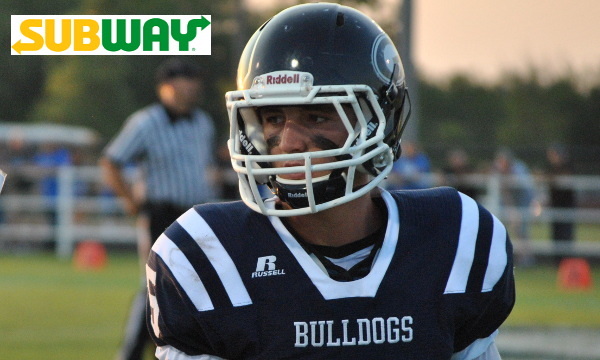 Remember, when you visit Subway this week, thank them for supporting Kpreps and Kansas High School Football! Weather dominated the Kansas high school football theme for Week 6. The threat of severe weather forced administrators to move several games up to early evening on Friday, but unfortunately there were still multiple delays and postponements. Let’s take a look some of the action that did get finished on Friday night. Atwood-Rawlins County won back the yoke with a 40-32 upset victory over their rival St. Francis. The loss was the top-ranked Indians first regular season defeat since 2014, and the first for Rodney Yates since taking over as head coach in 2015. Overall, Yates has led the Indians to a 26-3 record in his two-plus seasons. The win keeps Rawlins County’s playoff hopes alive after the Buffs suffered a 22-6 loss to Hoxie in Week 4. A loss to St. Francis would have left Rawlins County hoping for a monumental upset of either St. Francis or Hoxie in the remaining district games to have a shot at the playoffs. Still after Friday’s victory, the Buffs may still need some help to reach the postseason. Rawlins County has three district games remaining and can finish no better than 5-1 with a total district points margin of 76 points. Meanwhile, Hoxie can finish 5-1 with a total district margin of 92 points, and St. Francis can finish 5-1 with a total margin of 84 points. Should the three teams tie with 5-1 records, the two teams with the top district points margin will qualify for the playoffs. Rawlins County has to hope that St. Francis and Hoxie play some close district games in the coming weeks. The second-ranked Burlingame Bearcats overcame a long road-trip and a long weather delay to shut out Clifton-Clyde, 48-0, on Friday night. Both teams entered Friday’s action unbeaten in a game that was chose by Kpreps fans as the statewide Game of the Week. The Bearcats led 6-0 after one quarter and a goal line stand of Clifton-Clyde helped the Bearcats to retain the first-half momentum. Burlingame eventually led 20-0 at halftime when the game was delayed for several hours due to severe weather. The Bearcats scored twice in the third quarter when action resumed to lead 36-0. Two more fourth-quarter touchdowns ended the game with two minutes left in the fourth quarter. West Elk used a strong defensive performance in picking up a 36-22 road win at St. Paul. The Patriots scored three consecutive touchdowns to turn a 16-14 deficit into a 36-16 lead. West Elk quarterback Cade Miller accounted for all five Patriot touchdowns in rushing for three scores and passing for two more. St. Paul got on the board first after a West Elk turnover set up the Indians with a short field. Quarterback Braven Born scored from 27-yards out for an 8-0 lead. West Elk would respond with a Miller touchdown run and a scoring pass from Miller to Andrew Hurt for a 14-8 lead. Adam Albertini capped a wild first quarter with a long touchdown run to put the Indians up 16-14. The Patriots scored twice to take a 28-16 halftime lead, and Miller added his final touchdown midway through the third quarter. St. Paul responded when Albertini returned the ensuing kickoff 70 yards for a score. Second-ranked St. Thomas Aquinas dominated St. James Academy 34-14 in an Eastern Kansas League showdown of ranked 5A teams. The Saints led 27-0 at halftime and 34-0 until St. James cracked the scoreboard on a Jack Petz touchdown run late in the third quarter. Aquinas quarterback Will Swanson rushed for a pair of touchdowns and threw a touchdown pass to C.J. Eddy in the first half. Cameron Jackson and Tristan Davis each had scoring runs for the Saints. Aquinas rushed for 286 yards in the game, while the Saints’ defense held the Thunder to 160 yards of total offense. Jackson led Aquinas with 148 yards on the ground, while Petz led the Thunder with 109 yards and a score on 20 attempts. The win by Aquinas knocked St. James from the ranks of the unbeaten and allowed Bishop Miege to capture the EKL championship outright. Galena essentially wrapped up the CNC League title with a dramatic 33-29 victory over 4A-II No. 1 Columbus. The Bulldogs dominated for much of the game in building a 26-7 lead before Columbus came storming back. Galena scored early and converted a Titan turnover into a 12-0 lead. The lead grew to 26-7 in the second quarter before Columbus running back Keenan Stanley broke his second long touchdown run to bring the Titans within 26-14 at the break. Stanley scored his third touchdown to cut the Galena lead to 26-21 in the third quarter. Columbus then converted a short field into a Ridge Smith touchdown run to take a 29-26 lead with 7:43 remaining in the game. Galena would come right back behind quarterback JC Shelton. Shelton returned the Titan’s ensuing kickoff to midfield, than ran the remainder of the way on the next five rushes to give the Bulldogs a 33-29 lead with 5:20 remaining. Columbus would threaten late facing a 4th-and-7 at the Galena 19-yard line with under a minute to go, but Galena’s Drake Adams broke free and sacked Ridge Smith to end the Titan threat. Shelton rushed for 72 yards, passed for 49 yards, and returned a punt for another score. Stanley led Columbus with 259 yards on the ground and three scores. Dexton Swinehart scored five touchdowns and created four Osage City turnovers in Lyndon’s 30-17 victory on Friday night. The win essentially clinches the Flint Hills League championship for the Tigers. Swinehart rushed 33 times for 236 yards and five scores in the game. Lyndon led 24-17 at halftime and held off the Indians in the second half. Swinehart picked off two Osage City passes and forced and recovered a pair of Indian fumbles as well. Wichita Northwest outscored Garden City 30-0 in the second half en route to a 36-23 victory on Friday night. The Grizzlies trailed Garden City 23-6 at halftime, but scored on an Austin Anderson touchdown pass to Jax Reynolds in the third quarter to pull within 23-13. Breece Hall then pulled the Grizzlies within 23-20 on a 5-yard touchdown run in the fourth quarter. Northwest then took the lead on a touchdown pass from Anderson to Jalen Smith. Shortly after, Jordan Herrman intercepted Garden City quarterback Garret Doll and returned it 46-yards for a touchdown with under two mintues remaining. Northwest would then add a 45-yard Josh Benoit field goal late to attain the maximum 13-point margin of victory. Garden City dominated the first half as Doll threw a pair of touchdown passes to Tye Davis and Anthony Flores connected on three field goals. The script was almost an exact replica of last year’s game with the two teams reversing roles. Last year, Northwest led 27-0 mid-way through the second quarter, but the Buffs scored a pair of touchdowns before halftime to pull within 27-14. Garden City then shutout the Grizzly offense in the second half to finish a wild comeback and a 46-34 victory. In a battle of unbeaten Mid-East League teams, Silver Lake extended its streak to 21 straight wins over Riley County with a 41-14 victory on Friday night. After a scoreless first quarter, the Eagles scored three touchdowns in the second quarter and led 20-7 at the half. The Falcons could only get within 26-14 in the third quarter before Silver Lake put the game away with a pair of fourth-quarter scores. Mason Jones rushed for a pair of touchdowns in the win for the Eagles. The Silver Lake defense was again solid, allowing only one score. Riley County’s other touchdown came on a fumble return for a touchdown. Bishop Miege built a 41-0 halftime lead at Mill Valley and cruised past the two-time defending 5A champs, 54-21. Carter Putz threw three touchdown passes and added a touchdown run in the Stags big first half. Putz connected on touchdown passes with freshman Phillippe Wesley, sophomore Daniel Jackson, and senior Quinn Scheiber in the first half. Cameron Clark also scored on a pair of touchdown runs for Miege. Mill Valley scored three late touchdowns to round out the scoring. Miege’s win coupled with St. James Academy’s loss to St. Thomas Aquinas gives the Stags the outright Eastern Kansas League title. Miege and St. James Academy do not play each other thiss season. Manhattan will hold on to the Silver Trophy for another year as the Indians routed rival Junction City, 42-12. Manhattan led 21-12 late in the second quarter before adding a pair of touchdowns in the final two minutes before halftime to blow the game open. Quarterback Talon Claussen scored on a 25-yard touchdown run, and shortly after the Manhattan defense returned a Blue Jay fumble for a touchdown and a 35-12 halftime lead. The victory gave Manhattan a sixth win in the last ten meetings between the two rivals. Friday’s result was a rare blowout in the series as the previous eight meeting had been decided by nine points or less. Before Friday, the last double-digit margin of victory in the series was a 30-6 Junction City win back in 2008, the year the Blue Jays won the Class 6A state title. In its final season in the Centennial League, the Shawnee Heights T-Birds claimed their first share of the league title since 1994 with a 27-14 win over Topeka Hayden. Mitchell Lady and Trey Jenkins each topped the 100-yard mark as the T-Birds churned out nearly 240 yards on the ground. Lady and Michael Hoffer scored on touchdown runs in the first half to give Heights a 14-6 advantage. Lady expanded that lead to 21-6 in the third quarter on a 20-yard run. Hayden would pull within one score on a fourth-quarter touchdown pass from Sampson Huston to Matthew Moore. Jenkins later added a touchdown to push the Heights’ lead to two scores. Shawnee Heights earns a share of the league title with Manhattan and Topeka High. The T-Birds defeated Manhattan 21-18 to open the season, and fell to Topeka High 48-14 last week. Meanwhile, Manhattan defeated Topeka High, 21-14, back in Week 4. In Central Kansas League action, Hoisington (4-2) delivered a key victory, 32-14, at Nickerson, ranked in Class 4A-II. The Cardinals forced six turnovers including five interceptions. Hoisington got a key interception just before the half that prevented a touchdown. On one play, Jake Curtis had an interception when it bounced off the umpire. Hoisington led Nickerson 16-14 at halftime and held the Panthers (4-2) scoreless after the break. Wichita Heights used a key interception and a blocked punt to set up a pair of fourth-quarter touchdowns that turned a 24-20 deficit into a 34-24 victory over Kapaun Mt. Carmel. Trailing 24-20, Falcon linebacker Ja’Veon Johnson intercepted a Kapaun pass and returned inside the Crusader 10-yard line. K’Vontae Baker would score from 9 yards out to put the Falcons up 27-24. Later, Heights’ Jalen Williams blocked a Kapan punt and recovered at the Crusader 8-yard line. Baker would score his fourth touchdown to extend the lead to 34-24. Wichita Heights (4-2) improved to 4-0 since returning to full strength after Week 2. Heights trailed Kapaun, 17-14 at halftime. Kapaun (4-2) took the lead just before intermission on a 55-yard field goal. Second-ranked Jefferson County North stepped out of district play to pick up a narrow 12-6 win over Christ Prep Academy on Friday night. Sam Larson’s 39-yard touchdown run in the second quarter gave the Chargers a 6-0 lead that they would hold through the mid-point of the fourth quarter. Ridge Robertson pushed the Charger lead to 12-0 on a 10-yard run with just over five minutes remaining in the game. Christ Prep responded about 1:20 later on a Noah Blair touchdown pass to Gerail Lucas to pull within 12-6. Robertson led Jefferson Co. North with 108 yards rushing on 16 attempts. Osborne defeated Logan-Palco, 44-10, on the road in another big Eight-Man, Division I, District 4 victory. The majority of the game was played in pouring rain. Logan-Palco closed to 16-10 with 4:56 left in the first quarter after a safety before Osborne responded with 28 unanswered points. The Holloway brothers had big games. Junior quarterback Darnell opened the game with a 60-yard touchdown run and went 7 of 8 passing. Sophomore running back Darrien started the second half with a TD and had three rushing scores with more than 100 yards. Osborne (5-1) outgained Logan-Palco, 416-156. Trojan senior running back David Thompson recorded 25 rushes for 130 yards, but Osborne’s defense came up with several key red zone stops. Logan-Palco dropped to 4-2. In Eight-Man, Division II, Dighton defeated Sharon Springs-Wallace County, 20-8, in a key District 6 home win that effectively eliminated the Wildcats from playoff contention. Wallace County (1-5) has made the playoffs every year since 2006. Dighton (6-0) is 18-1 since the start of last fall. Central Plains won at Little River, 52-12, in a matchup that will likely decide the two playoff berths from Eight-Man, Division I, District 5. Both teams entered with one loss. Central Plains led 14-6 at halftime and 38-12 in the middle of the third quarter before a 30-minute lightning delay. The Oilers have captured 22 straight district games.